CHIAVARI: between modern shops, craftsmanship and culture, the sea is still the main attraction. 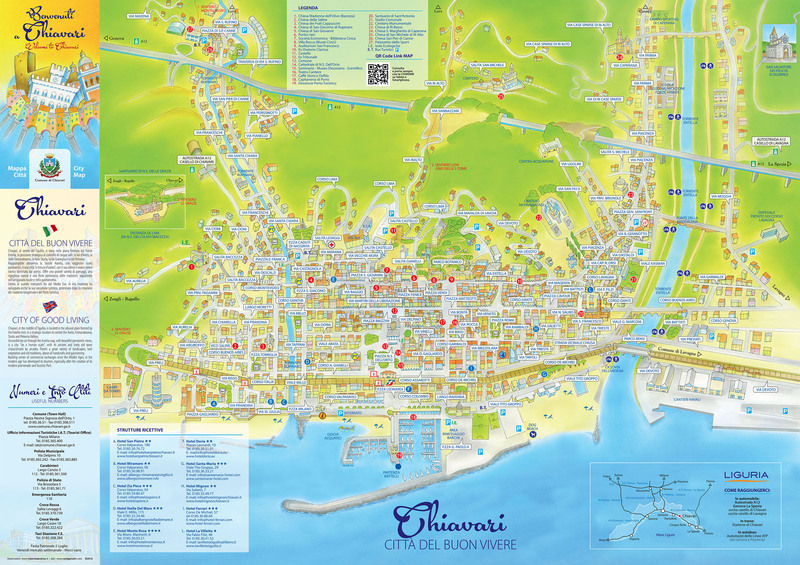 Chiavari is the “capital” of Tigullio’s, it’s commercial and residential center and financial heart. But it is also a a wonderful place to be discovered by tourists and boaters. With its medieval medieval center and its nineteenth-century portico it opens up panoramic views of incomparable beauty: it’s a man made city. An ancient city that boasts prestigious palaces in typical Genoese style, that has developed as a tourist’s haven between the sea and the countryside. A tourists perspective that is grown and strengthend by the city’s port, Marina Chiavari, is completely integrated within the city. The sparkling sea, well-maintained beaches and the environemntally sustatinable port management allow Chiavari to raise the “Blue Flag” both in the city – since 2000 – and in the harbour – since 1987. Long, sandy beaches are typical of the coast and are easily accessible by the newly renovated and expanded sea promenade. Bars, gelato parlors, restaurants, and children’s playgrounds will make your seaside strolls even more pleasant. Turning onto any of the numerous underpasses, you can easily traverse the colonnaded historical center on foot, where you can find all of the city facilities: shops, supermarkets, cinemas, theatre, parks, etc. The historical center is centered around the “caruggio dritto” – a carriage path – considered Tigullio’s open air shopping center thanks to its rich variety of shops, boutiques, historical cafes and lively alleys, scattered with “trattorias” and restaurants. Some of these specialize in making the famous “farinata” – a regional specialty made of ground chickpea meal and baked in huge ovens. Even elegant and modern businesses find the atmosphere artisanal, thanks to all the classic arches that are still intact. Chiavari is also home to fishermen and craftspeople and you will delight in discovering te local chair called “Chiavarina” and beautiful “hand tattered” laces. 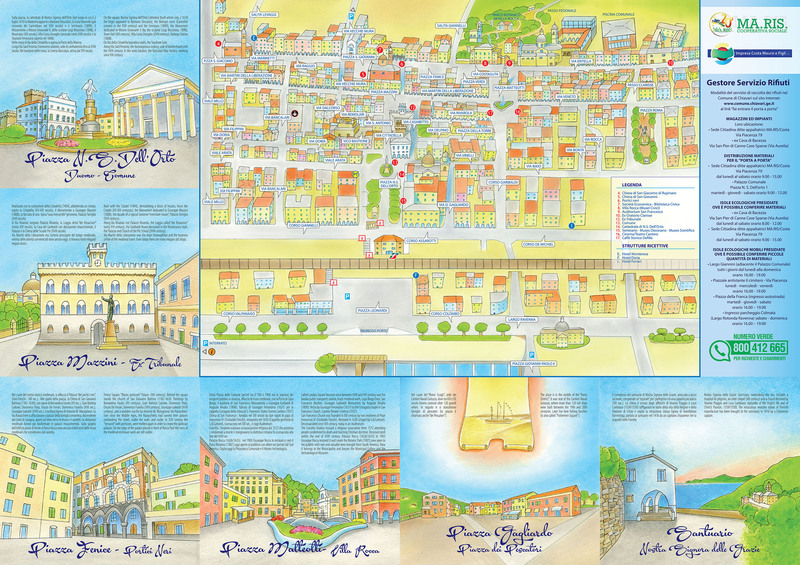 The Ancient Clavarium (the key of the valley) is a city that has intersected with history since prehistoric times, formed under the Roman empire, to become a Fieschi fiefdom, a Renaissance city and the capital of Tigullio under Napoleon and the kingdom of Sardenia. The city still has many historical records that can be found at street corners marking archeological artifacts, churches, palaces, castles, statues and fountains. Chiavari offers a diverse array of entertaining, cultural activities: Among the most important palaces there is Palazzo Rocca. The botanical garden is simply breath-taking with its huge greenhouses full of orchids. The now-famous antiques market takes place every second weekend of the month in “Caruggio Dritto” as well as the many “ flavors and traditions” markets, highlighting typical agri-food products and artisans. A must-see is the “Nostra Signora Dell’Orto Sanctuary”, inspired by the Pantheon in Rome. For who loves discovering new territories and traditions, the Chiavari countryside is the perfect place to be. Leaving the coastline, climbing to the top of the hills you can enjoy the beautiful vista and the quiet of nature. There are itineraries on foot or by bike, abbeys and sanctuaries to visit, typical restaurants and trattorias where you can taste traditional Ligurian farmer dishes. Paralell to the sea, Fontanabuona Valley is like a second dimension of the eastern Riviera that can be discovered via the “Slate Bike Path”. “Liguria is made of slate”: roofs with rectangular grey plates, staircases and churches’ courtyards, domes and bell tower spires. Slate comes from Fontanabuona and some caves are open for visiting. Fontanabuona valley is scattered with many towns, each one with its own identity and trattorias. During the summer season, these towns light up with many different festivals, country fairs, fireworks and folklore. Not to be missed, are the hundreds of water mills and furnaces from the medieval times. They were used to grind wheat coming from Po valley, to transform it in flour for bread, to then be transported from covered wagons to the markets of the Genoa Riviera. For the athletic, the new “slate bike path”, along the Entella river, allows you to enjoy the valley by bike.